My need for privacy and security for me & my family was paramount. It's been fine to be honest, I don't miss it at all. I hear all the gossip/news from my close friends and from alternative social media. I do find people look at me weirdly when I tell them I don't have Facebook though, as if I'm somewhat afflicted. I still use Twitter & Instagram (@jaithinks) to promote my music, podcast and brand. How do you socialize now? How do you keep in contact with people? I keep in touch with a handful of people who truly matter to me via phone & Whatsapp messenger, where as when on Facebook I had 1000 or more friends/associates/ex colleagues/school friends and barely had actual interactions with any of them. It's definitely worth it, especially if you're going through a shift in your own personal life. It's very easy to look at Facebook and make comparisons and judgements. By deleting it from your life you simplify things much more. "Don't compare other peoples' showreels to your behind the scenes." For a lot of people Facebook is their life, normal human interaction has dwindled significantly since they've got increasingly deeper in to Facebook. For others it's a powerful networking tool that has enhanced their brand or business and opened opportunities for them. So who's to know what it will become in the future, all I know is that I will continue to steer clear of it. The views expressed here are my own and like I said previously, my reasoning behind deleting Facebook was very significant. Most of my friends still have Facebook and I don't judge people for doing so. But like I said when you're growing and shifting in your personal life, challenge yourself to 30 days Facebook free and notice the difference. 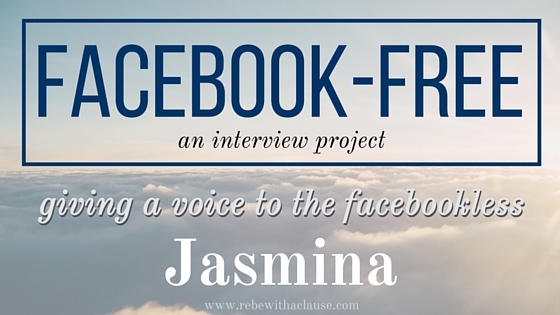 Thank you so much for sharing your experiences and thoughts with us, Jasmina! I especially loved the quote you shared about not comparing others' showreels to your own behind the scenes—that's so important to remember.